This is the highest quality duct made. 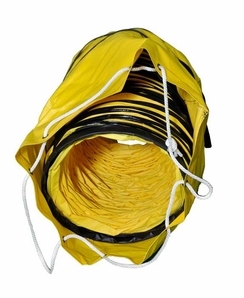 These durable and long lasting ducts feature a single-ply neoprene impregnated polyester fabric with a continuous spring steel wire helix for support. Hot melt wear strips cover the helix for added durability. This duct is ideal for moving large quantities of air into hard to reach places using positive pressure and will fit on any Super Vac PPV. This duct can also be used as an extension to create a longer duct when attached to another Super Vac spiral duct. All ducts come with a built-in storage bag for easy transportation. The Spiral Duct can also be used as an extension. Need a longer duct to reach harder to get to places? No problem, just attach two ducts together using the belted cuff.